In this one hour radio interview, Ian Rankin discusses The Complaints, eating five candy bars a day, Inspector Rebus, ebooks, and almost becoming a police suspect. 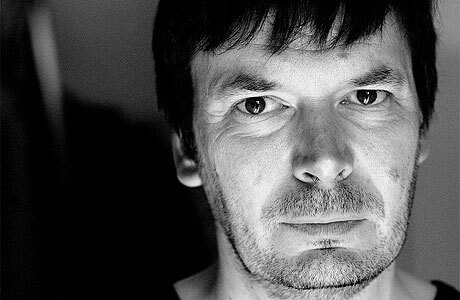 Ian Rankin appeared on The Bat Segundo Show #390. He is most recently the author of The Complaints. Condition of Mr. Segundo: Playing good cop and bad cop with his interlocutory approach. Subjects Discussed: The benefits of talking with a Scotsman on St. Patrick’s Day, sartorial description in prose, pleated miniskirts, balancing descriptive detail against dialogue, people who are intended to be larger than life, on not describing the central character, physical descriptions that compete with the expectations of television, Malcolm Fox vs. John Rebus, trying to make a protagonist who isn’t a maverick compelling, the adjacent sounds of garbage being emptied, what tastes in music reveal about character, family and backstory, the connections between Rebus’s father in The Black Book and Rankin’s father, moving past autobiographical connections, Rankin’s early pursuit of an English degree, avoiding the existential possibility of Ian Rankin the Accountant in early years, parents who don’t understand, Woody Allen, the limitation of locations in Edinburgh to write about, Doors Open, financial institutions and cities, Edinburgh as a microcosm for Scotland, the economic collapse as a creative muse, occupations that permit access to every layer of society, Michael Connelly’s start as a journalist, journalists-turned-novelists, sources who retire, making things up vs. research, not getting too close to the police, The Wire, the disadvantages of amateur detectives, Mario Puzo making the mob up in The Godfather, when imagination turns you into an unexpected police suspect, Hide and Seek‘s close similarities to real crime, serendipity, the universal nature of office politics, how much police procedure a writer really needs to know, being oblique enough to be believable, writing a first draft in six weeks, William Gibson, writing and revising on the road, Alexander McCall Smith’s prolificity, the danger of forgetting plot details, eating multiple candy bars per day as an alternative to nicotine addiction, nonsmokers who write convincingly about smoking in fiction, Rankin’s addictive personality, computer games, Iain Banks’s addiction to video games and Scottish roads, Rankin’s addiction to Twitter, being unable to tweet using a European phone due to the draconian wifi costs established by hotels, keeping a diary vs. maintaining a Twitter feed, writers as public property, the drawbacks of instant feedback, Facebook, The Social Network, Twitter as an exercise in editing, eBay addiction, compartmentalizing time, the possibilities of bringing Rebus and Siobhan Clarke back, not having a storehouse of ideas for future books, comics and working on Dark Entries, the creative differences when working with another person’s character, John Constantine, Neil Gaiman, hanging out with Alan Moore, naming characters after literary writers and rock stars in The Complaints, when too many character names begin with the same letter, long and ambitious novels, biases against shorter novels, Muriel Spark, The Prime of Miss Jean Brodie, the poet’s talent of distillation, the rising market share of ebooks, commercial forces and maintaining a mystery series, attracting new readers for a series, parallels between the publishing and the music industries, speculating on a future industry of freelance editors, independent bookstore alternatives to Borders, the modest revitalization of vinyl, the frequency of cheek gestures within The Complaints, repeating words and phrases, intrusive commas, manuscript fatigue, becoming part of the old guard mystery writers, and keeping books fun after multiple books. Correspondent: Michael Connelly, who was also a journalist at one point, has discussed how he was worried that, as a journalist, a lot of his sources and a lot of his contacts would possibly go away. And this would prevent him from getting a lot of really interesting stories that he could put in his novels. I’m wondering if you’ve faced anything similar to that with your network of sources. Or whether you have accidentally burned a source. Have there been any problems? Rankin: The problem with my sources is that a lot of them have retired. Rankin: If they were my age — I mean, I’m going to be 51 this year — most of them have retired form the police. So guys that I met in my mid-to-late twenties when I was starting the [Rebus] series are now gone. And you either have to find a new set of people. Or you just make it up. I mean, it is fiction after all. What I do is that I’ve got enough people around me who can help me with the detail if I need them. But I don’t want to get too close to the police. Because I don’t want the books to become public relations exercises for police. And, of course, the only people who will talk to you are the good cops. The ones who are straight, you know. They’ll talk to you. Well, if that’s the only people you’re meeting, you might feel constrained. You might feel you can’t suddenly write about cops who’ve broken the rules or who’ve bent the rules a little bit. So I only go near the police when I need them. I mean, with The Complaints, I did need to talk to someone who worked in internal affairs. I set that up through another contact, who’s a senior police officer. But it was a couple of hours of conversation. And that was all I needed. That gave me a sense of what this organization would be like, what the office politics would be like, what kind of powers they have, what kind of stuff they did. Two hours. And the rest of it is invented. Correspondent: Have facts and background been more of a limitation than a help throughout your work? Rankin: Well, I do think there’s restrictions on what you can and cannot do. Because readers are much more sussed than they used to be. I mean, they’re watching cop shows on TV — whether it’s reality shows or dramas. Correspondent: Or The Wire for that matter. Rankin: Yeah. But they feel they know what goes on forensically. They feel they know what goes on at a crime scene. So you can’t suddenly start taking liberty. I mean, I’m very lucky. Because my guys are professional cops. Therefore, they would be at the scene. It’s much harder if you’re talking a kind of Miss Marple character. This notion that an amateur detective — a Lord Peter Wimsey or a Miss Marple — could just turn up at the crime scene and trample all over it. And that the cops wouldn’t give him a good kick up the backside and send him on their way. These days, it’s much harder for readers to take on board and accept. So I don’t write about private eyes. And I don’t write about amateurs who just happen to get caught up in drama. I write about people who get invited into the drama. Because that’s their job. Correspondent: On the other hand, there’s, of course, the famous story that Mario Puzo made all of The Godfather up. So much so that mob people were reading this and they were saying, “How did he know so much about this?” Is this similar to your situation when you invent something? That almost inventing layers or systematic connections is almost better than relying on getting something right. Rankin: Well, I mean, on the very first book that I wrote, I got the idea for the plot. And then I went to a police station to talk with a couple of cops. You know, just to get some background and some detail. And they asked me what the plot of the book was. And I told them. And it turned out that it was very close to a case they were working on. So they viewed me as a possible suspect for a short time. Until they decided that I was just insane. But the next book after that — Hide and Seek — two or three years after the book was published, a similar case came to light. And that gave me great kudos in Edinburgh. Because cops and the public alike said, “How did you know about this stuff?” I mean, it was kind of there. It was happening a few years ago. But it wasn’t. It hadn’t come to light then. And I had just invented it. And it came true later on. So people thought I knew what I was talking about. But I really wasn’t. I was making it up. And that continued to happen. There was a lot of serendipity. That I would just write about something that then seemed to be true. And it worked the other way as well. I would take a really true thing like the G8 — when the G8 came to Scotland. And that was just a great source of information. All you had to do to research that book [The Naming of the Dead] was to live in Scotland for a week. And that was a very easy book to write from my point of view. Because about half of the stuff in there actually happened. Up to and including President George W. Bush falling off his bicycle while trying to wave to a police officer. In my book, it’s Rebus. I mean, what if it wasn’t? It was someone else.